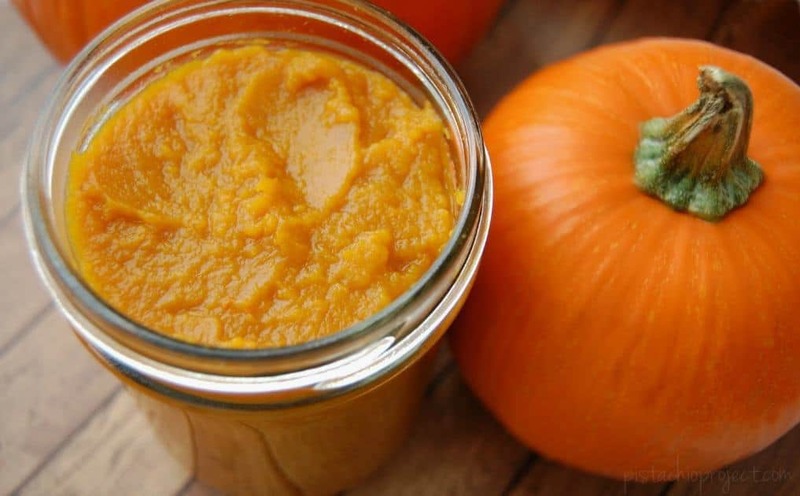 Let’s face it, pumpkin puree is quite the seasonal thing and it’s very easy to just buy a few cans of puree. However, if you are like me, you cringe when you settle for canned products. But if you are also like me then you know you need pumpkin puree for #AllThingsPumpkin like pumpkin spice smoothies, pumpkin face masks, and of course pumpkin pie! Canned food has a few reasons for not being all that great, in case you didn’t know. There is the fact that most cans contain BPA in the lining and thus BPA ends up in your food. There’s also the fact that canned is obviously not as nutritious as fresh because it’s been processed. 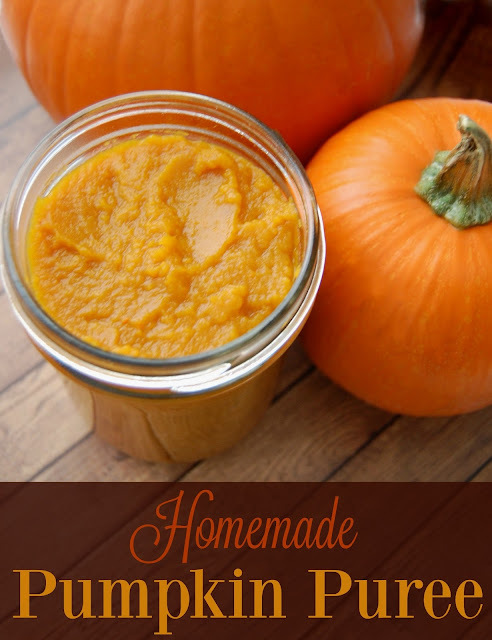 The good news is that homemade pumpkin puree is actually quite easy. I just made a batch of puree and now I’m going to show you how I did it. Small pumpkins – You can use any pumpkins but the smaller ones such as “pie pumpkins” are the ones that taste best and have the best texture. Slice off the top of your pumpkin (You know, the stem part). Scrape out the seeds and pulp from the center of the pumpkin. Place pumpkin pieces on a baking sheet face down (so skin side up) and roast at 350 degrees for 30-45 minutes. When you can easily pierce the pumpkin meat with a fork, it is done cooking. Place all the meat into a food processor or blender and whirl away. You may need to add a bit of water. Puree till it’s smooth. Voila pumpkin puree! You can use the puree immediately, store in the refrigerator for a few days, or freeze for later use. I roasted two pie pumpkins and ended up with about 6 cups of pumpkin puree. We have already used all of it up so I need to go buy more pumpkins. If for some reason you are having an incredibly hard time cutting through your pumpkin, then you can throw them in the oven WHOLE for a few minutes (no more than 10). This will get them just soft enough to cut through. I however, haven’t had to do this yet. Thanks! I just picked up some pumpkins from our CSA today and need to try this! i usually cook so much pumpkin at a time it takes over 3 hours to cook… lol good stuff! We are with you 100% on fresh ingredients. We made pumpkin cheesecake with our puree. It was amazing. Wow. I never really thought about the inside of cans before..I'm not sure if they're lined with BPA in Europe, the Netherlands specifically, as well, but on the other hand, supermarkets dont sell canned pumpkin puree here. As a matter of fact, pumpkins are only available in the stores for a couple of years now, so we're still getting to the stage where they sell 'em chopped and pureed. So thanks for posting the recipe! Great idea! My kids don't like the taste of pumpkin but will happily eat pumpkin cornmeal muffins! I'll have to make some puree up in the next week or two. Do you pressure cook your puree? 🙂 And thanks for the article! I had just learned this year that the store bought pumpkin is mostly Hubbard Squash. Who knew? I have not pressure cooked my puree yet but you definitely can!